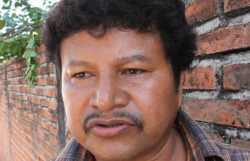 On August 17, 2009, masked men carrying high caliber rifles forced anti-mining activist Mariano Abarca, 52, into an unmarked car as he was leaving the primary school in his hometown of Chicomuselo, Chiapas. Held without contact to his family, it was feared he had been kidnapped. But although the detention had all the hallmarks of a kidnapping, it turned out to be a state sanctioned arrest. CHICOMUSELO, MEXICO—On August 17, 2009, masked men carrying high caliber rifles forced anti-mining activist Mariano Abarca, 52, into an unmarked car as he was leaving the primary school in his hometown of Chicomuselo, Chiapas. Held without contact to his family, it was feared he had been kidnapped. But although the detention had all the hallmarks of a kidnapping, it turned out to be a state sanctioned arrest. For the next eight days Abarca, a father of four, was held on charges that included “criminal association and organized criminal activity.” The detention was based on accusations made by Mexican employees of Calgary-based mining company Blackfire Exploration Ltd, and supported by vice-president Brad Willis’ statement to police. Blackfire has been operating a barite mine in the town of Grecia, in the municipality of Chicomuselo, for approximately two years. In Mexico, Blackfire operates through its subsidiary Blackfire Exploration Mexico S de RL de CV. According to an investigation by the Human Rights Center Oralia Morales, people in nearby Nuevo Morelia are unable to use a river for water due to mining activity and report skin irritation if they bathe in the water. Abarca has been the leader of an anti-mining movement in the area that initiated a largely symbolic road blockade in June. 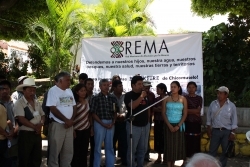 He was also one of the main organizers of a weekend conference held on August 29 and 30 in Chicomuselo and sponsored by the Mexican Network of People Affected by Mining (REMA). Local activists interpreted Abarca’s detention as an act of intimidation for those planning to attend the conference. But more than 240 people from as far away as Canada and Guatemala participated, and, if anything, the detention strengthened the resolve of Mariano and his compañeros, who say they are as ready as ever to keep fighting. Journalist Dominique Jarry-Shore spoke with Mariano Abarca during the REMA conference. She also recorded a short video of the interview, which is accessible through the Media Co-op. Dominique Jarry-Shore: Why are you fighting against mining in Chicomuselo? Mariano Abarca: What they’re doing to our municipality is basically looting the land. But apart from that, the government hasn’t taken us into account in their decisions and the company executives (Blackfire Exploration Ltd.) have never made themselves available to the people of the community. How is this project going to benefit and affect us? We have no idea. That’s one of the things we’re unhappy about. We’d been asking the state and federal government to explain what the project is really about and how we will benefit and be affected, but we had no explanation so we had to make a decision. We decided to close a road here in town that the company uses to get to and from the mine. Thanks to the support of our neighbors and people in our organization we were able to block the road. The company’s not happy with it because they say they’re losing money. But really, what we’re asking is that they leave Chicomuselo altogether. We don’t want to have people here who treat our people—labourers and people of modest means—with the toe of their boots. They threaten us. And the worst of it is that they’re part of our community because some people from our town work for the company. That’s created divisions between us. Has Blackfire made promises to the community? Yes, they offered a road, a health center, doctors and training so that people would have the skills to work for the company—all that was offered to the people in the town where the mine is located. Other things were offered as well—about 20 different things—like drinking water. Either they haven’t delivered on their promises or what they have done has been of very poor quality. The tanks they built for drinking water are full of leaks and are no good. And as I said before, the worst part is the social problem within the communities. Some say the company is good; others say it’s bad. That situation worries us a lot. Even in my own home some workers threatened to kill me and then of course there was my detention for defending the people. Were you mistreated while you were detained? Fortunately, no, I wasn’t mistreated. The worst of it was not being able to contact my family and my colleagues (on the first day), and the threat of being put in prison. What message do you have for Canadians? Don’t do to others what you wouldn’t do to your own people. I think the government of Canada should be more careful with these companies who come to Mexico and treat us badly. I call on the Canadian government to do something because we’re the same as any other citizen. We have rights too. What do they mine here? From what we can understand, it’s a material called barite. It comes with antimony. And there’s also gold and silver and another mineral I can’t remember the name of. But from what we know it’s a big mine. They’ve been extracting for two years and already there are big problems so imagine if they’re here for 40 or 50 years. Chicomuselo could disappear. We have a duty to do something. Were you surprised by the international reaction to your detention? Yes, but I was in seclusion. I didn’t know what was happening outside. When I was released people told me that my detention had served a purpose and we feel it did a lot for our cause. We were surprised by the support from all over the world and I’m very thankful and encouraged to keep up the fight. Dominique Jarry-Shore is a freelance journalist based in Chiapas, Mexico. This interview was carried out with the aid of a grant from the International Development Research Center in Ottawa.